The highest certification level of CWNP is the CWNE. CWNP certifications are vendor neutral, which means they are about wireless networking and specifically about Wi-Fi on a general level. Cisco CCIE Wireless and Aruba ACMX are also high level certifications, but they are about a single vendor’s products and solutions. The world is much more diversified. Certified Wireless Network Professionals is an U.S. based organization, which has been developing a certification program for Wi-Fi/802.11/WLAN technology since 1999. The fundamental idea was to be vendor-neutral. IEEE 802.11 standard applies to all – as do the laws of physics, governing radio waves and their behavior. If you know the Wi-Fi fundamentals applying the knowledge to any vendor’s solution is fairly straightforward. The entry level CWNP certifications are the CWS and CWT (Certified Wireless Specialist and Technician). The former is for non-technical personnel like salespersons and the latter is somewhat more technical and is intended for installers, for example. These two used to be a single certification known as CWTS. No entry level certification is required for the higher levels. Certified Wireless Network Administrator or CWNA is more advanced. It requires thorough understanding of radio frequency physics, radio waves, antennas and software side like encryption and authentication. CWNA is an excellent way of finding out where you stand in the Wi-Fi crowd. From a Finnish standpoint outdoor antennas and microwave links are a lot less important than they appear in CWNA. On the other hand, they are only covered in CWNA. After CWNA comes three professional level certifications: Design Pro, Security Pro and Analysis Pro (CWDP, CWSP and CWAP). Each one of these expands on subjects already covered in CWNA. Design Pro is about designing wireless networks, Security Pro is about data protection: encryption and authentication, while Analysis Pro is about protocol details, network packet contents and troubleshooting. CWNE is different. There are no tests or classes to attend. CWNA, CWDP, CWSP and CWAP are prerequisites. In addition you need to have three years of full-time field experience, other supporting certifications, documented Wi-Fi projects and endorsers. CWNE doesn’t cost anything, you can’t buy it. You can apply for CWNE status and CWNP will grant it if they deem you worthy. The CWNE program started in 2001 and as of writing there are 307 certifications. In recent years about 50 certifications have been granted annually worldwide. I have been a full time IT consultant since 1980’s. The first networks were AppleTalk and telecommunication was accomplished with modems. I came across TCP/IP on Unix systems already in the 80’s, but the Internet made TCP/IP ubiquitous in the 90’s. I remember having seen my first Wi-Fi access points around the turn of the millennium. I did install some early 802.11b access points, but they were curiosity items and didn’t see much real use. Slowly APs became commonplace and the number of users increased. Some Wi-Fi networks didn’t work as expected and I was often asked to troubleshoot. Unfortunately I couldn’t do much beyond checking the configuration. I tried to find someone who was skilled to troubleshoot Wi-Fi but I never found anyone. Nobody wanted to admit anything, but I saw shaking heads and shrugs. I, too, started to believe Wi-Fi was impossible to understand, you could only hope it worked. After 2010 Wi-Fi became a necessity. Smartphones and tablets increased the demand for wireless connectivity. The users wanted to use their laptops wirelessly, too. 802.11n provided the capacity, but not all networks performed the same. I still couldn’t find anyone to help, so I decided to dig into it myself. If it was designed by humans it had to be comprehensible for humans. I read books, tried out products from different vendors and set up labs for different scenarios. I still was uneasy wether I was doing the right thing. Then I came across CWNP. In 2015 in took the CWTS test without any preparation. I passed at 50/60, which has been my worst score so far. I knew next to nothing about outdoor Wi-Fi, microwave links and special antennas. All my experience was based on indoor office networks. On the other hand, I knew them, I was on the right track. And now I had found a learning path to follow. For all my CWNP certifications I have been reading books by myself. There have been only occasional CWNP classes in Finland. On the other hand, I don’t believe a single week can prepare you for a test. At least I have studied for months, but not full time of course. On the side I have acquired vendor specific certifications like Cisco, Ubiquiti, MikroTik, Aruba and LigoWave. All the vendors must adhere to the same laws of physics and the 802.11 standard so there is more in common in the solutions than there are differences. Naturally the products all look different and the level of configuration control differs. A common question is “Which order is best for the Pro-exams?” There is no set answer. The only requirement is that you must have passed all of them and they must be valid at the time of application. I did Security Pro first, because I have a strong security background. Key exchanges, encryption methods, handshakes and PKI are familiar to me. I took the Analysis Pro next and Design Pro last. With hindsight I would suggest Design Pro first, because I found it the easiest and most applicable to general Wi-Fi work. Take Security Pro second to save Analysis Pro last. AP last because it is the toughest and you don’t want it to expire in case you take more than three years to pass them all. They also overlap somewhat, so by taking DP and SP first you have already prepared for some of the AP material. From the books I have read I can recommend the CWNP series by Sybex. CWNP used to have a deal with Sybex to publish books aligned with the certifications. The exams are updated every three years and Sybex would produce a new edition to cover the latest exam. This deal doesn’t exist any longer and CWNP is publishing their own “official” study guides. The quality of these books hasn’t been impressive. Fortunately Sybex has continued updating their series. Just make certain the book covers the latest version of the exam before buying. Even if you don’t plan to certify, the recently renewed CWNA is an excellent handbook that covers Wi-Fi thoroughly. Decibels were invented in the Bell phone company to quantify signal loss in telephone wires. Soon the new unit was discovered to be too large so in practice the tenth of the unit was used, thus deciBells. The second L was dropped so we are using decibels. The original capitalization still shows in the abbreviation dB. Decibel is a logarithmic unit of level that doesn’t contain any actual unit. It is the ratio of two values. Ratio is division so the units cancel out. In Wi-Fi the signal levels and transmit powers are compared to milliwatts so the unit is called dBm. Antennas are most often compared to a isotropic radiator and then the unit is dBi. If you compare two decibel values to each other, the resulting is always plain dB. For example signal to noise ratio (SNR) is the signal (in dBm) minus the noise level (in dBm) resulting in plain dB. For example -66dBm-(-96dBm)=30dB. It is still a ratio since in the logarithmic scale the subtraction equals division in the linear world. Zero cannot be represented in a logarithmic scale. 0dB represents equality. For example one milliwatt of power is 0dBm. Respectively negative numbers are smaller than the reference. -20dBm is 0,01mW or a hundredth of a milliwatt. -70dBm is a common signal level, which would be 0,0000001 in milliwatts. Logarithmic decibel makes it easier to present and compare very small and also very large numbers. You can convert milliwatts to decibels and back as mental calculations. Let’s start with milliwatts to decibels. Dozens of milliwatts is 10 in dBm, hundreds is 20 and thousands is 30. Respectively tenths is -10, hundredths is -20 and thousandths is -30. Doubling milliwatts equals three decibel increase. For example 200mW is in the hundreds or “20”. One hundred has to be doubled so add 3. The answer is 23dBm. Respectively 400mW is 20+3+3 or 26dBm or 80mW is 10+3+3+3 or 19dBm. You can convert decibels to milliwatts in the same fashion. Divide the decibel value by ten (to get full Bells). Then move the decimal point by the result. Positive values move the decimal point to the right and negative to the left. Then look at the remainder and multiply (or divide if negative) by two for every three in the remainder. For example 16dBm is 10mW×2×2 or 40mW and -66dBm is 0,000001mW÷2÷2 or 0,00000025mW. How many milliwatts is 19dBm? A small network at home or in a small office may consist of only a single access point. It covers some area and outside of coverage there is no network – very simple. To cover a larger office or a multi-storey home requires multiple access points. The users may move from the vicinity of one access point to the next. How does Wi-Fi roaming actually work? In the 802.11 standard the client devices choose the access point they want to associate with. APs don’t have any control over roaming. The good news is that no coordination is required for roaming. As long as the APs broadcast a network with the same name and the same password, the clients can transparently switch from one AP to another. Roaming works even across APs from different brands. You can have an Asus in the living room and a D-Link in the kitchen and your Skype call will transparently continue when you walk from room to room. No configuration is required. The roaming above does require that the access points are just bare access points. Most consumer grade APs are also routers, firewalls and IP address dispensers. The Skype call will disconnect if the user moves from behind a firewall to behind another and even gets a new IP address. The interruption will not show up in browsing or email applications since they don’t require continuous connection. Enterprise access points are typically plain access points and the firewall is at the uplink to Internet. In this scenario the roaming is seamless. You can achieve this with consumer grade equipment as well, but it will require some configuration changes. Sometimes the roaming is not seamless. The most common problem occurs when the client device won’t roam even when there is a better access point nearby. Most client devices won’t active look for better APs but will only start looking for one when the connection degrades significantly. For example Apple iOS devices will start looking for a new AP when the signal level drops below -70dBm. Most other vendors don’t publish exact figures but they are in the same range. For some reason the trigger is typically only signal strength or RSSI. Noise ratio (SNR) or even transmission errors or retries don’t matter if the received signal is strong enough. Why would there be transmission errors if the signal is strong? If there is a big mismatch between AP and client transmit powers. The AP may transmit at 200mW when a cell phone may max out at 15mW. The phone will receive a strong signal from the AP while the AP can barely receive the phone. As long as there is some kind of connection the phone won’t even look at other APs. The current one is still showing “full bars”. Only when the connection is completely lost will the phone start scanning, which may take seconds. In that time all connections will break. This will occur even if the user is standing right below an AP. The signal from AP is strong but the AP is at the edge of the coverage area of the phone. Transmit power level mismatch is also the most common cause for uneven distribution of clients over the access points. In the worst case all client devices are associated with the AP in the lobby, if it covers the entire office. The devices associated with the lobby AP when they arrived and haven’t roamed since because the signal is strong enough. All other APs are underutilized while one or few are over utilized. The solution to these roaming problems is to turn down the transmit power of the APs to better match the user devices. A big difference in power levels won’t do any good, it will only cause trouble. Transmit power is like good cognac or whiskey: enough is good, too much is bad. The basic principles of 802.11 roaming aren’t going to change. However, there are a few add-ons to help client devices with roaming. 802.11k adds a list of channels to all beacons the access point transmits. This list will tell clients which channels are in use for this network. The client devices won’t need to scan through the whole spectrum when looking for a new AP. The devices will typically listen on each channel for 200ms while scanning. If there are 24 channels on 5GHz it will take almost five seconds to scan through all of them. 802.11v adds information on access point utilization to the beacons. This will hint the clients to choose an AP with less load, even if the signal is slightly weaker. Data throughput may still be better than in a crowded cell. 802.11r standardizes client authentication improvements and is often known as Fast Roaming. In the common WPA2 Personal or Pre-Shared Key the authentication is fast enough already so there is no benefit in using 802.11r. However, in WPA2 Enterprise the AP has to contact a RAIDUS server to authenticate the client, which is slow. In 802.11r the client devices will pre-authenticate with nearby access points just in case it will need to roam. When it does, the authentication is already completed so the switch is quick. 802.11 k, r and v (or a subset) are either on, optional, off or unsupported depending on the system. If you have 802.11k and/or 802.11v then you should turn them on in a multi-AP environment. They may confuse some old Android devices so you need to test the effects in your network. In WPA2 Enterprise networks you should test 802.11r, but don’t turn it on in WPA2 Personal networks. 802.11r causes even more compatibility problems so you should again test the net effect. Buried deep in the advanced settings of the Wi-Fi access point there is a setting with a friendly title like DTIM Interval or DTIM Period. The default setting is typically one. Change it to three, five or slightly larger, but don’t go over ten. Often you can set it separately for 2.4GHz and 5GHz, but use the same value for both. This is the short answer. Read on to find out what this is all about. To extend the battery life all cell phones and tablets spend most of their time in different sleep modes. Switching off radio transmitters is one of the most efficient ways to save power since the transmitters are very power hungry. Even if the display is on and there is a game running the Wi-Fi radio may be off. The Wi-Fi radio will be powered on only when the user browses the net or some background app checks for messages, then it will go off again. As a matter of fact, the radio is actually switched off multiple times during browsing. It is switched on only momentarily as needed. It really makes a difference in the battery life. Most network connections are opened from the client device. For example the device will periodically check for emails. In some apps the initiative is on the server side: the server will send a message that the device should perform some action. For example a VoIP call is coming in. If the Wi-Fi radio is off there is now way to receive such messages. Broadcast and multicast messages are similar. The server will send a single message that is addressed to all or a group of devices. However, the server doesn’t know which devices are sleeping and which aren’t. Somehow the sleeping devices should also receive the message. Wi-Fi access points send a beacon ten times a second. In the beacon there is a map of client devices which have buffered packets addressed to them. All devices wake up every tenth of a second to check if they should start receiving data. These wake-ups are very short and the display is not powered up, but still they consume power. The DTIM Interval setting controls which beacons contain this information about upcoming data packets. If you set it to three then only every third beacon will contain the info. This means the dozing devices can sleep over two beacons and only wake up on the third. That means they will wake up only three times a second. With larger DTIM values they will sleep longer. For example with the value of 5 they will wake up just twice a second and with 10 just once every second. So what does DTIM stand for? It is an acronym for Delivery Traffic Indication Message (or Map). The Message just Indicates that there is some Traffic to be Delivered to Mapped devices. The setting this article is about is DTIM Interval or Period, which is the multiplier, but it is commonly referred to as DTIM value. Apple iPhones won’t wake up more often than to every third beacon, even if the DTIM value for the network is one. Apple’s customers are very concerned about their battery life and the delay of a few tenths of a second is a small price to pay. Apple has made the decision for its customers. What will happen to data packets destined to an iPhone if the DTIM value is one but the iPhone acts like it were three? Nothing much. Unicast packets are buffered at the access point until the iPhone wakes up. The buffering will take up some memory space in the AP but no data is lost. Some broadcast and multicast packets will be lost, but most of the time they are not important for the dozing device. By setting the DTIM value to at least three you can avoid the loss of data and give Android devices the same advantage of better battery life. During daytime phones are typically used actively, which will consume much more energy than waking up from sleep. At home the devices spend much more time sleeping. Or they would, if they didn’t wake up ten times a second. That’s why you should increase the DTIM value in your home Wi-Fi. The larger the value the less the battery will drain during the night. Are there any drawbacks to increasing the DTIM value? An incoming VoIP call alarm may be delayed by a fraction of a second – that shouldn’t matter. 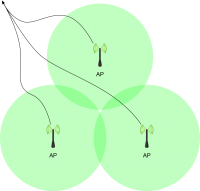 Broadcasts and multicasts are buffered at the AP until they are delivered. The AP memory is limited and in theory the buffer could grow by a hundred megabytes every second. That’s why ten is a good rule of thumb for the upper limit of DTIM. Many APs won’t even accept larger values. Of course you can test and see if you notice any drawbacks. There are consumer grade Wi-Fi APs that won’t let you adjust the DTIM Interval, but most APs appear to support it. It is hidden amongst the scary “advanced settings” but it is really safe to modify. You can always go back if you need. If you can’t find the setting try searching the web for your AP model name and the word DTIM. Another way to decrease battery consumption during the night is to place the phone as close to the AP as possible. The phone will use lower transmit power level which will save energy. Even a small change will help. Just by leaving the phone on the other side of the bed is an improvement, if it is closer to the AP. What are the user expectations or requirements? It is a completely different matter to serve 40 IoT devices that occasionally transmit sensor data than to serve 40 user devices displaying separate 4K video streams each. VoIP calls like Skype won’t transfer that much data, but they are very sensitive to delays (called latency) and fluctuation in the delay (called jitter). So you first need to find out what kind of applications the users have in mind. The problem is that this is a moving target. Each time you improve the network the users will find uses for the new capacity. That means the expectations and requirements will be totally different next year. Wi-Fi is a shared media, which means the devices compete for air time. While one device is transmitting the others are receiving or at least wait in silence. (802.11ac introduced MU-MIMO which allows concurrent transmission for a few devices at a time, but this hasn’t changed the situation significiantly.) The net result is that as the number of devices grows so does the queue of devices waiting for a turn to transmit, which will increase latency and jitter. The more data is transferred the higher is the utilization, which increases the wait times as well, since the turns are longer. Think of it as a negotiation table. As the number of negotiators increases the longer it takes for each get a turn to speak. If the speeches are long it will take even longer to get a new turn. In Wi-Fi there is no chairman to give turns in order, but the process is somewhat random. The more area an access point covers the more variety there will be in the client connection qualities. Some devices will be closer to the AP while some will be at the edge. The devices on the edge will use hundreds of times more time (the minimum rate is 1Mbps) to transmit the same amount of data as the devices close to the AP (at 300/450/600Mbps). In theory transmitting one megabyte at 1Mbps takes 8 seconds or 8000ms while it takes just 13ms at 600Mbps. In practice you should double those figures to account for the overheads and acknowledgments but still the ratio is 1:600. Some vendors will give you a figure: 50, 100 or 255 devices. The last one probably just means how many devices the AP can hold in memory at one time. 255 devices competing for air time is an impossible scenario, unless we are talking about the IoT devices sending sensory data once a minute. The 50–100 devices per AP is the well known case when a hotel advertises “We have FREE Wi-Fi!” Yes, they do, but it is useless. According to 802.11 the theoretical limit is 2007. Most chipsets will set the bar lower: 100, 128, 255 or some other number. There is no point in comparing the figures. They don’t tell anything about the power or quality of the AP. One access point can support a high number of clients, if the devices are near by. This is the case for HD or High Density access points some vendors offer. They have a little more memory and a better processor, but the main difference is in the antenna design. The antennas are designed for short range. If all the devices are within the same conference room they can all be connected at 300Mbps at least. The air time can be split into very short slots so everyone gets a share and still have useful bandwidth. These APs are designed to prevent connections from outside the room because those would be slower. You can place multiple HD APs in a large auditorium if necessary since the coverage is designed to be small, at least if you turn the transmit power down. You can use a couple of dozen of devices per access point as a rule of thumb. If you are designing for a high capacity network, use more APs and smaller cells. There will be less devices in each cell and each one will have a better connection. Both will improve the capacity of the network on its own and together they complement each other. It is a win-win and the cost of modern APs makes this affordable. If you need more accurate estimates I recommend the Excel models by Andrew von Nagy. Author Petri RiihikallioPosted on 23.02.2018 12.06.2018 Categories WiFiLeave a comment on How many users can one Wi-Fi access point support?